Researcher & Vice President, Lovettsville Historical Society. Sgt. Lawrence Everhart of Revolutionary War fame is claimed by both Lovettsville, Virginia, and by Middletown, in Frederick County, Maryland. How can this be? Johannes Lorenz Eberhard (or Eberhardt) was born in the village of Hessheim, near Frankenthal, in the Rhineland Palatinate of Germany, in 1755. He was the oldest child of Christian and Sybilla Eberhard. With his parents and some younger siblings, he came to America in 1764. At some point, Lawrence’s parents and his younger siblings moved to the German Settlement, now Lovettsville, where his parents and many of his brothers and sisters are buried. Many of their descendants can still be found here today. However, Sgt. Everhart is also claimed by Middletown in Frederick County. He lived there before the Revolutionary War, he served as a Methodist minister there after the War, and is buried there with a prominent monument. Herein lies our mystery. How can Everhart be “from” both Lovettsville and Middletown? I believe that the confusion arises because Sergeant Everhart’s parents Christian and Sybilla, and his younger brothers and sisters, moved to The German Settlement (Lovettsville) in 1787, after his father had sold his land and possessions in Maryland. Lawrence’s father at first leased land on George’s Mill Road just off Irish Corner Road (later owned by the Riddlemoser family). Lawrence’s parents lived here for the rest of their lives, and are buried in the old German Reformed (St. James) cemetery. Lawrence’s siblings also lived in Loudoun County for the rest of their lives and are buried here, except for his sister Elizabeth (Snook), who is buried in Harper’s Ferry, and sister Christina (Bagley), who is buried in Ohio. Of his other siblings, Philip and his wife Charlotta Axline (daughter of Revolutionary War patriot John Axline) are buried in the Reformed Cemetery in Lovettsville, as are his brother William and William’s wife Catherine Axline, a sister of Charlotta. His brother Christian Everhart Jr. is also buried in the Reformed Cemetery. His brother Michael is buried in New Jerusalem Lutheran Cemetery with his wife Christina Wertz (daughter of Revolutionary War patriot Peter Philip Wertz. His sister Barbara (Derry) is buried in the Old Ebenezer Cemetery in the Between-the-Hills area of Loudoun County. So it is beyond dispute that Lawrence’s family were all in the German Settlement/Lovettsville area after 1787. What about Lawrence? Sgt. Everhart was discharged from the Continental Army in 1782, and returned to Middletown and lived with his wife at his father’s farm. He had married Mary Ann Breckenbaugh in Frederick County in late 1781 or early 1782. He first appears in Frederick County land records in 1784. By some accounts, he reenlisted in the Virginia Continental Line in 1784 for three more years. After his military service, he again returned to Middletown and reportedly acquired more land through a Revolutionary War land bounty. Although he apparently never resided in the Lovettsville area, Lawrence did lease land here for five years, from 1791 to 1796. Loudoun County land records show that in December 1791 Lawrence Everhart of Frederick County, Maryland leased land from Adam Axline (a brother of John Axline), a parcel of land which Adam Axline had previously leased from George William Fairfax in 1786. In November of 1796, Lawrence assigned his lease to David Axline; the witnesses on the transaction included John Axline, and Michael and Philip Everhart. 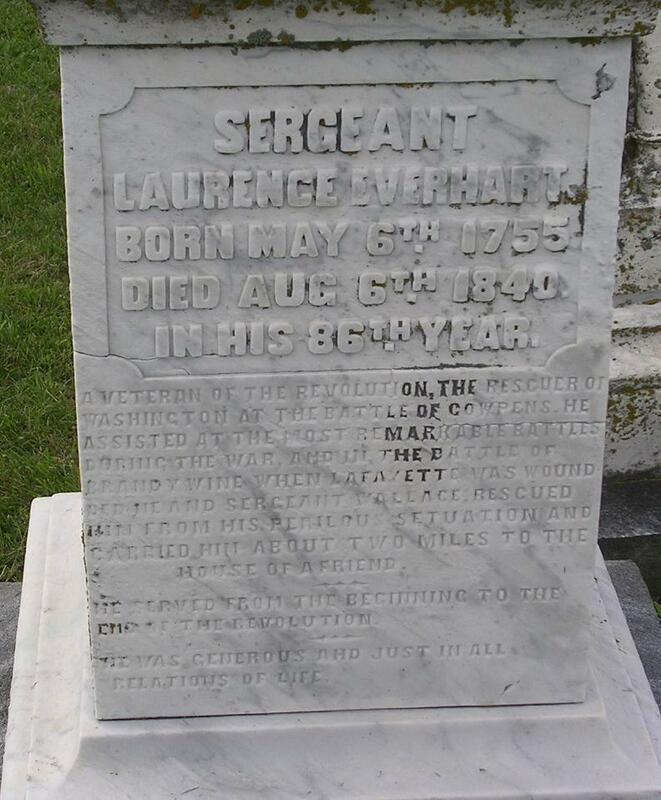 Lawrence Everhart, Revolutionary War hero with family ties to Lovettsville, VA. The existence of these land leases has been known to Everhart family researchers for years. I found some additional documentation of Lawrence’s legal presence – if not residence — in Loudoun County during these years. I found this in the Loudoun Country personal property tax records for the years 1792, 1794, and 1796. In 1792 Lawrence Everhart is listed as owning personal property of six horses; in 1794 he is shown owning one black [slave], and six horses, and in 1795, he has two blacks and six horses. The most likely explanation of this, I am told, is that he had a team of horses and one or more slaves who farmed the Loudoun County property for him, while he was still residing in Maryland. His brothers may have also helped him farm the land. Lawrence is the only one of the Everharts who owned any slaves in Loudoun County, according to the tax records for those years. Lawrence also paid real property taxes on 237 acres of land in Loudoun County in 1793 and 1794. Otherwise, Lawrence’s presence in Middletown and Frederick County (Maryland) is well-documented. He owned land there from 1784 on. In 1795, a Declaration was recorded in which he freed some of his slaves. In 1799 he freed another slave named Jacob in Frederick County. Lawrence’s children – as far as is known – were baptized in either the Lutheran churches in Frederick and Middletown, or in the German Reformed churches in those two towns. In addition to farming, Lawrence also took up the ministry. He was first ordained in the United Brethren church, a German Reformed denomination inclined toward the Methodists. He preached at a church called the “Martenbox” in Middletown, which was next to the Lutheran cemetery where he is buried. 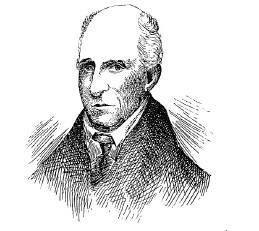 A few years later, in 1808, he was ordained as a Methodist by Bishop Asbury, the founder of Methodism in America. In both of those churches, he reportedly preached in German – which was the case in most German-American churches in this area until the 1830s. George Washington is said to have visited Lawrence in 1799 in Middletown. In 1824, Lawrence was seated in the second place of honor, when Lafayette visited Frederick during his return tour in the United States. Lawrence died in Middletown in 1840, at the age of 86, and is buried there. A Veteran of the Revolution, the Rescuer of Washington at the battle of Cowpens. He assisted at the most remarkable battles of the war, and in the battle of Brandywine, when Lafayette was wounded, he and Sergeant Wallace rescued him from his perilous situation, and carried him about two miles to the house of a friend. He served from the beginning to the end of the Revolution. He was generous and just in all his relations of life. In sum: Sergeant Everhart was a real Revolutionary hero. Although we must concede that he was not “from” Lovettsville, we can be proud of his association with Lovettsville and the German Settlement, and of the fact that his parents and many of his siblings did live here, and many of their descendants are still here today. If you have any additional information which may shed more light on Lawerence Everhart, please let us know at info@lovettsvillehistoricalsociety.org.